XMAS 2013 : Gift Surprise! I sent you many gifts, but I forgot to put your names on them! Last edited by Karma; 12-14-2013 at 02:00 PM.. The gift inside each numbered item will be revealed the next day. Santa left many gifts, so make sure you send an email everyday till event is over! 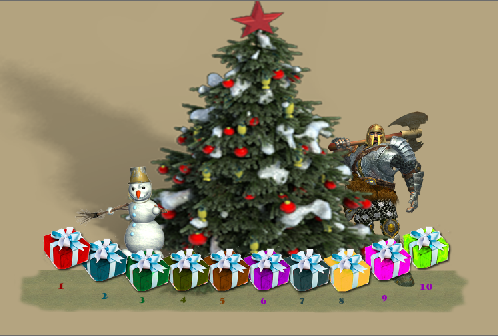 1 - Each Gift box will not contain same item each day. Last edited by Genius Mind; 12-12-2013 at 01:48 AM..
1. One entry per person, per day. 2. Two players can chose the same gift number (GMs will clone the gift box). 3. On the email, include: number between 1-10, Character Name - everyday! 4. You cannot send emails for other players. 5. Each Day's email has to be sent by midnight, server time. 6. Some prizes can be exchanged. 7. Event is for EN only, and not cross-server. You must notify us if you want to exchange prizes no more than 3 days after end of each event day. You can send game pm or email as soon as you know what prize you received. The event will start today, so send your first email soon! The last day of the event will be announced later. Last edited by EkNa; 12-12-2013 at 01:46 AM..
We Hope you have enjoyed the event and received your wished rewards. Merry XMAS and Happy Holidays Everyone!